This is a very simple and common side dish that goes well with meat, fish or chicken. 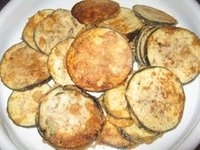 The eggplant slices are also great in sandwiches. You can vary some of the ingredients and seasoning to your taste -- I prefer a simple preparation.